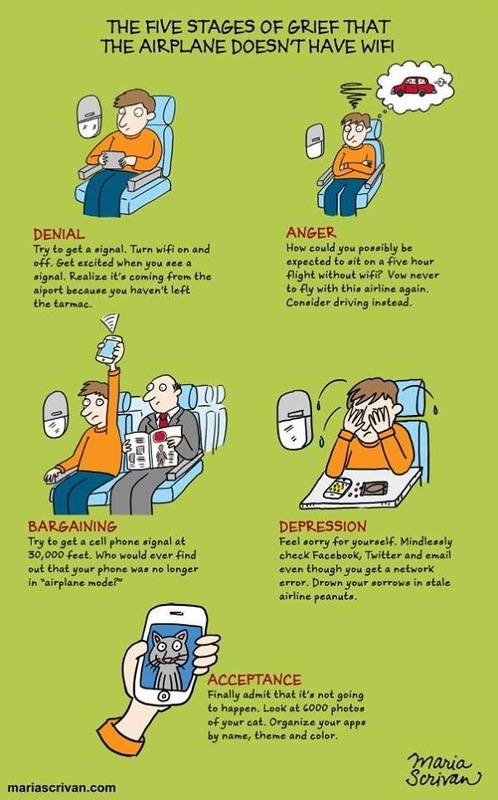 It is clear the Five Stages of Grief that occur when the aeroplane doesn’t have wi-fi is real… when we were in the USA earlier this year, it was very tempting to purchase it for the flights, as it is available over there. Desperate I am not (yet)! I must say, now that I am a real twit (i.e. have an active twitter account, and I used to think twitter was for twits! ), and enjoy spending time chatting on Facebook and also play online scrabble… losing wi-fi is rather a pest!. But not to take all the blame for our home internet quote getting used up… my husband plays online war games, and these days our monthly internet gets used up! For many years, we rarely used more than half of our quota, but perhaps now, it is just as well I don’t have wi-fi when flying, or we would be easily over the current cost effective limit! It is amazing how much data is consumed on seemingly innocuous pastimes. My darling got sucked into playing ‘Words with Friends’ with a friend who compiles cryptic crosswords and then got the shock of his life when he found out he had run out of data at the beginning of the month!!!! Now he hasn’t played for at least a month! Funny how a hit to the hip pocket can curb some behaviour.